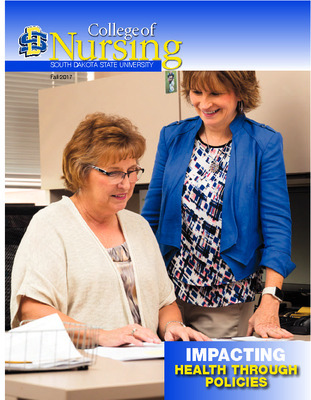 The College of Nursing magazine is published semiannually by the Office of University Marketing and Communications in conjunction with the College of Nursing. 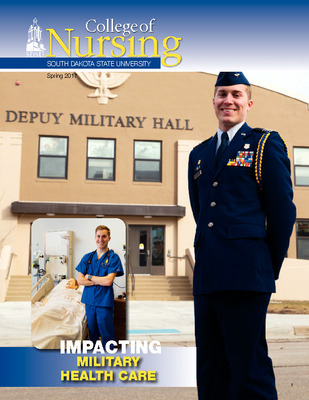 Profiles of student nurses who became military health professionals. [Page] 2 Meet Dolores (Gleich) Pogrebniak and Nick Westphalen, two Army Student Nurse Program participants on opposite ends of the chronological spectrum. [Page] 3 Deployment delays nurse practitioner studies for Alex Kalsbeck. [Page] 3 Commissioning to Navy Nurse Corps gave faculty member the opportunity to serve U.S. president, other dignitaries. [Page] 4 Undergrad Nick Westphalen credits time management for being able to meet the demands of ROTC training and a nursing degree. [Page] 6 Veterans John Mills, David Cole find rewarding careers as nurses at Sioux Falls VA.
[Page] 8 Bostic twins find National Guard the perfect prep course for nursing. [Page] 10 Camp Gilbert experience connected accelerated students with diabetic children. [Page] 12 On the other side of the table. Recent grads return as recruiters at job fair. [Page] 14 Jonas Scholars: Alexandra Draisey, Shannon O’Connell-Persaud, Travis Erickson selected for 2016-17 award. 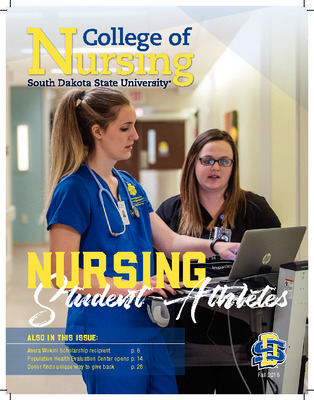 [Page]16 Ela Nielsen develops broader perspective as president of South Dakota Nursing Student Association. [Page] 20 K Reeder honored by the American Heart Association. [Page] 20 Five State grads honored by South Dakota Nurses Association. [Page] 21 College makes list for AffordableCollegesOnline.org. [Page] 26 First graduate— Rachel Foss. Daughter recalls the pioneering journey of her mom, a 1936 graduate. [Page] 28 Distinguished Alum — Karen (Billars) Heusinkveld, UT-Arlington professor, honored by SDSU. [Page] 29 Stacey Tait-Goodale— Development director recalls how her military experience challenged her in nursing school. 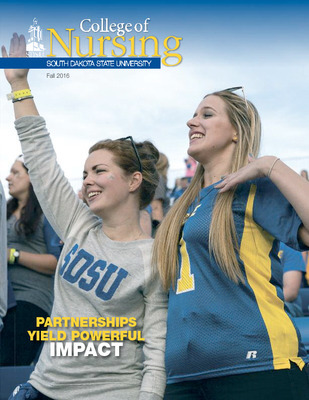 [Page] 2 South Dakota State alumni contributed to “The House of Nursing” as it supported the passing of SB61. 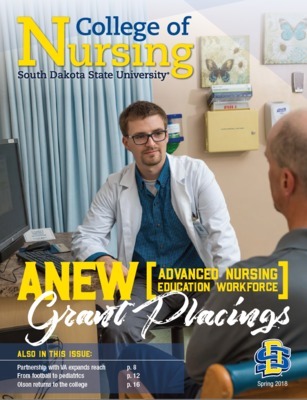 [Page] 4 Graduates lead the South Dakota Board of Nursing. 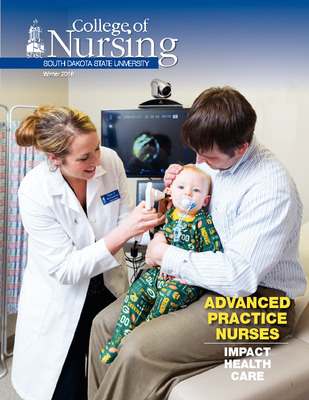 [Page] 5 Damgaard and Young create virtual nursing-care model. 6 Soholt’s drive helped pass SB61. [Page] 7 Berkland’s career now has her in executive role for Sanford Health. [Page] 8 Students attend national summit in D.C.
[Page] 10 Researchers review tobacco-free policies for state’s health-care facilities. [Page] 12 Social media campaign helps living kidney donations among Native Americans. [Page] 14 Three students present at NANAINA. [Page] 16 Hansen receives Distinguished Service Award. [Page] 17 College receives grant to develop rural providers. [Page] 18 Assistant deans named for Sioux Falls and Aberdeen. [Page] 19 Varilek named to GNSA Leadership Council. [Page] 20 Moller delivers Deans’ Distinguished Lecture. [Page] 22 Stuefen named a Robert Wood Johnson Foundation Scholar. [Page] 23 Nenaber named nation's top clerical nurse specialist. [Page] 24 Four new scholarships awarded. [Page] 25 Stacey Tait-Goodale — Development director talks about Wagner Hall’s potential third-floor renovations. [Page] 2 — Path to awarding graduate degrees has been worth the effort. [Page] 6 — Work/work balance—Faculty members discuss teaching and health-care careers. [Page] 10 — Finding her niche: A class section spurs Kim Nearhood to find her passion. [Page] 12 — West River Nursing Program graduates first DNP class. [Page] 13 — Certified nurse midwife Brenna Tate gets to experience miracles. [Page]14 — Lesley Cook and Julie Jones found ideal careers with VA.
[Page] 16 — It took some time but Susan Leddy found a role she loves. [Page] 17 — Grant Jaspers makes the most of recent degree. [Page] 18 — Brenda Andersen plays a major role in care of Jackrabbits. [Page] 20 — Donelle King enjoys the relationships made as a DNP. [Page] 22 - Stenvig receives multiple honors. [Page] 23- College receives grants to impact health care. [Page] 26- Baker and Cundy named to 100 Great Iowa Nurses 2015 listing. [Page] 29- Stacey Tait-Goodale: Be part of a gift transformation. [Page] 2 — College holds first partnership summit. [Page] 4 — Wikaske Alliance has been busy in first year of existence. [Page] 5 — Career fairs popular with students and industry. 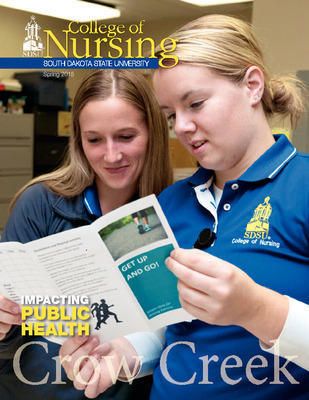 [Page] 6 — Betty Ferrell discussess spirituality in nursing. [Page] 7 — Kate Lorig delivers Deans’ Distinguished Lecture. [Page] 8 — State plays a major role in International Rural Nursing Conference. [Page] 9 — Elverson and Klawiter visit Ghana and plan to return. [Page] 10 — Tschetter and Carson travel to China to develop possible study abroad opportunities. [Page] 12 Transfer students enjoying classes, experiences at State. [Page] 13 2016 graduate finishes third in Miss South Dakota competition. [Page] 14 The potential impact of forensics on nursing. [Page] 16 Carson receives fellowship. [Page] 17 New faces to the College of Nursing. [Page] 21 South Dakota Hall of Fame inducts Koerner. [Page] 28 Ulmer named one of 2016’s 100 Great Iowa Nurses. [Page] 28 Gilbertson receives college’s distinguished service award. [Page] 29 Stacey Tait-Goodale The impact of endowments. [Page] 2 — Students work on Crow Creek reservation. [Page] 6 — Strengthening Native American families to help youth. [Page] 8 — Using cultural traditions to help Native Americans. [Page] 10 — Caring for the mind, body and spirit. [Page] 11 — College receives Impact Award. [Page] 12 — Examining smoke-free policies. [Page] 14- Eight join college’s faculty. [Page] 15- Former dean, alums receive honors. [Page] 16- Minton moves into associate dean role. [Page] 24- Worth receives college’s distinguished service award. [Page]18- DNP students experience rural life. [Page] 20- Hinsch, Kittelsrud receive Jonas Scholarships. [Page] 20- Goodales create an endowed scholarship for an outstanding scholar. 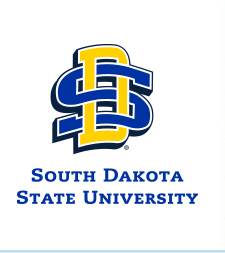 [Page] 21- Romness Foster and Relf named SDSU Distinguished Alumni. [Page] 22- Teamwork still part of Mason’s life 25 Dean’s Club. [Page] 25- Stacey Tait-Goodale Help celebrate the college’s 80th anniversary. [Page] 2 — Photo gallery of honorees. [Page] 6 — A brief look at the college’s history. [Page] 12 — The first four-year class. [Page] 14 — The gala’s honorees. [Page] 23 — Class of 1965 gives back. [Page] 24 — Alumni profiles. 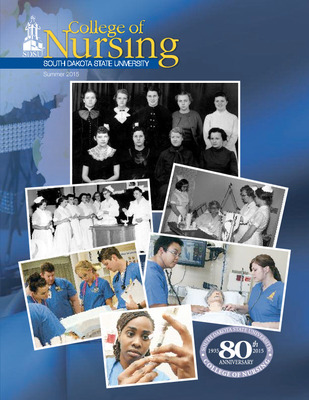 [Page] 28- Faculty and professional staff publications. [Page] 30- Faculty and student awards and honors. [Page] 31- Deans’ distinguished lecture. [Page] 33- Stacey Tait-Goodale Thank you for making the 80th Gala a success. Impacting Diversity — SDSU’s role touches the state. [Page] 2 — Kills Pretty Enemy’s risk-taking style enables her pursuit of doctorate. [Page] 4 — Schumacher’s worldly views gives her a perspective on health care. 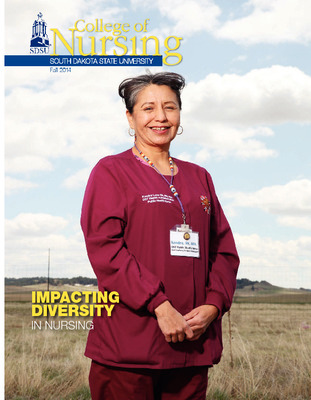 [Page] 6 — Grimshaw’s passion for patients fuels her nursing career. [Page] 7 — Silva Youpee gravitated toward health care. [Page] 8 — Degree allows Lone Elk to navigate numerous career moves. [Page] 10 — Burns takes nontraditional route to teaching and leadership. [Page] 11 — Conroy knows nurses play a key role in patient education. [Page] 12- Symposium addresses American Indian nursing education. [Page] 16- Publications by faculty and professional staff. [Page] 19- Robin Arends — State welcomes six faculty and a head of nursing student services. [Page] 20- Grant and award recipients. [Page] 22- 80th anniversary — Calendar of events. [Page] 14- Amanda Nenaber — Will to succeed still powers Nightingale winner. [Page] 25- Stacey Tait-Goodale — Looks to help lead college for next 80 years.